Although many people nowadays will not know his name, Harvey Milk remains a hugely important figure in American political history. As the first ever openly gay man ever elected to public office in the United States, Milk served one term as a member of the San Francisco Board of Supervisors in the late 1970s, and was responsible for passing a stringent gay rights ordinance for the city, before being assassinated by fellow city supervisor Dan White in November 1978. Having already been the subject of an Oscar-winning documentary, ‘The Times of Harvey Milk’, in 1984, director Gus Van Sant’s new film charts the life and death of a man who has since been labeled ‘a martyr for gay rights’ in dramatic narrative; the film stars Sean Penn as Milk, Josh Brolin as White, and features Emile Hirsch, Diego Luna and James Franco in supporting roles. Milk is Danny Elfman’s fourth collaboration with Gus Van Sant, after To Die For, Psycho and Good Will Hunting, and the second of these to result in an Oscar nomination for the erstwhile composer. 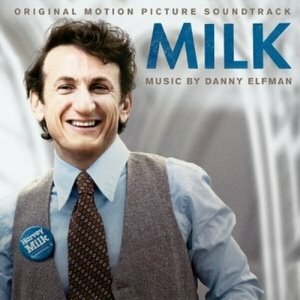 As one might expect, Elfman’s score portrays Milk as a noble, tragic figure in American political history, but thankfully stops short of all-out deification, instead recognizing the flawed, uncertain, human side of Milk’s character, while still acknowledging the hugely important legacy he created for the accession of gay rights in California. Anyone who has experienced the development of Danny Elfman’s musical style over the years will understand what I mean when I say that Milk falls most assuredly into the ‘modern’ end of his writing. Gone are the days of big, dramatic themes and beautifully icy orchestrations; the new Elfman is closer in tone and style to Philip Glass than his old self, and as such Milk follows that style, relying heavily on repeated note clusters, undulating rhythmic elements, and a generally introspective tone, albeit one which is augmented by a number of prominent solo instruments, notably piano and saxophone. The “Main Titles” are a perfect example of this new voice in his writing, consisting as they do of oddly-metered glassy textures and mourning violins, with the saxophone hooting sonorously over the top of it all. Cues such as “Politics is Theater”, “The Debates” and “Anita’s Theme” further engage in the textural similarities with Glass, almost comparing the political shenanigans that take place behind the doors of power to the endlessly churning wheels of a cog, or the innards of a clock, relentlessly repeating and on-going, but never truly seeming to make much progress beyond the machinations of the process itself. Once in a while there is a curious, but hugely engaging fusion of his newly-embraced minimalism with the rampaging brass ebullience and choral daintiness of early scores such as Beetlejuice and Edward Scissorhands that makes for intriguing listening. The more dramatic elements of the score are characterized in cues such as “Gay Rights Now!”, which introduce a tempestuous ostinato for timpani, glockenspiel and strings that adds a sense of urgency and excitement to the score, while remaining rooted in its minimalistic tendencies. The theme for Harvey himself, as heard in “Harvey’s Theme 1” and “Harvey’s Theme 2”, is warm and comforting, with soothing brass chords and a gently dignified string backing, which makes for genuinely attractive listening. Other cues, such as “The Kiss”, the lovely “New Hope”, the bright “Vote Passes”, and the elegiac “Postscript” have an equally upbeat aspect, occasionally even working a boy’s choir, a solo trumpet, and choppy, urgent percussion writing into the mix, as well as further distinguished statements of Harvey’s theme. The “Main Titles Sax Solo” which concludes the album, is a delightful showcase for the jazz-inflected talents of lead saxophonist Phil Todd. However, the best music is saved for the climax of the film (and score), in the cues “Harvey’s Last Day” and “Give ‘Em Hope”. It is during these cues that Elfman’s thematic prowess comes firmly to the forefront of the score, building from a gently romantic piano solo, gradually working in the contemporary rhythmic elements that filter through much of the score, and eventually emerging into a lush, but appropriately restrained rendition of Harvey’s theme for the full orchestra which successfully captures the sense of pride Milk’s life – and death – instilled in San Francisco’s gay community. I can see how Milk would not appeal to fans of Elfman’s earlier scores, and how some could even go so far as to consider it a little disappointing. It’s not a score which has big themes, or even especially big moments of emotional catharsis. It’s not even Elfman’s best score of 2008 – that accolade goes to his documentary score, Standard Operating Procedure. What Milk does do, however, is further illustrate the increasing maturation of Elfman as a dramatic film composer, with the musical chops to write successful, appropriate, intelligent music across a variety of genres, and for this reason alone comes recommended. Music composed by Danny Elfman. Conducted by Rick Wentworth. Orchestrations by Steve Bartek, Edgardo Simone, David Slonaker, Jeff Atmajian and Marc Mann. Featured musical soloists Ian Balmain, Nicholas Bucknall, John Parricelli and Phil Todd. Recorded and mixed by Peter Cobbin and Dennis Sands. Edited by Bill Abbott. Album produced by Danny Elfman. The last Gus Van Sant movie I saw was ‘Elephant’, a film that did not work for me. Thankfully he is back with ‘Milk’ which pretty much gives a detailed account of the rise of Harvey Milk and his martyrdom. Van Sant uses live footage between scenes which reminds one of how much harsher the world once was to people who were ‘different’. The writing is stupendous and the dialogues are especially effective. The portrayal of the characters are very human. There is no hero or villain. There are just humans with flaws, humans fighting for what they believe in. Van Sant sets a tense and chaotic tone right from the beginning. The 70s atmosphere is well created through makeup and costumes. The use of brownish tinted light may arise nostalgia. It is two remarkable performances that make ‘Milk’ stand out: Sean Penn’s very accurate and nuanced portrayal of Harvey Milk and Josh Brolin’s layered portrayal of a complex Dan White. I doubt ‘Milk’ would have been effective enough if it weren’t for such strong acting. The director deserves mention for his brilliant work. Movies like ‘Milk’ are relevant today because they serve as a reminder of how difficult life once was and how people fought against it and lives were sacrificed in order to create a better society for those living in today’s world.